The Dutch country code Top Level Domain remains among the most desired domains worldwide with more than 5,412,200 domain name registrations. 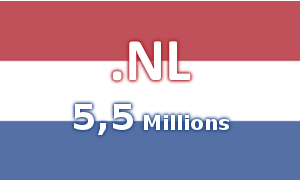 The number of registered domain names under the .NL ccTLD is approaching 5,5 million making the Dutch domain one of the most popular extensions worldwide. The .NL domain is the third largest ccTLD in the world following .DE with 15 million domain name registrations and .CO.UK with 10 million registrations. Since 2003, the .NL domain names have been available for registrations to individuals who make up for the great majority of .NL registrants. Data show that 21% of households in the Netherlands own at least one .NL domain name while 83% of businesses in the country own a website.